A foliage plant for shade with attractive flowers, Disporum cantoniense is a species that is slow clump forming and not invasive as some of its relatives seem to be. This is a plant for the shade border, it adds a little height so can be positioned back a little. We do like it far the front of the border as well where the flowers and foliage can be appreciated. You could also grow Disporum cantoniense in a container in shaded courtyard. Best grown in a humus rich soil with some moisture. Dappled shade is essential and we mulch around the plant each spring. Over time the clump will grow through the spread of underground rhizomes. The spread is relatively slow and does not present a problem in our garden. Although this is an evergreen to semi evergreen plant depending on the climate, we think it is at its best with regular pruning. Easy from seed and also by division of established clumps near the end of winter. 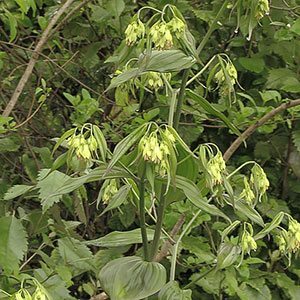 Common Names – Chinese Fairy Bells, Night heron, Canton Fairy Bells. Origins – From Nepal through to Vietnam in forested areas. Spread – Clump forming with top foliage to around .5 metres. Flowers – Creamy yellow to white followed by deep purple berries.